CARFAX 1-Owner, Audi Certified. REDUCED FROM $48,995!, EPA 30 MPG Hwy/21 MPG City!, $3,000 below NADA Retail! Navigation, Sunroof, Heated Leather Seats, Rear Air, All Wheel Drive, Turbo Charged, Alloy Wheels, S SPORT PACKAGE AND MORE! Leather Seats, Navigation, Rear Air. NAVIGATION PACKAGE Audi Connect PRIME & PLUS Online Services, subscription, MIB-2/Gen 2 features in addition to MIB-1: NVIDIA Tegra 3 processing, external voice recognition for smartphone personal assistant, INRIX XD Traffic, and over-the-air map updates, safety and emergency services, vehicle services and remote services, Audi Virtual Cockpit, 12.3" LCD fully digital instrument cluster w/1,440 x 540 pixel resolution and 2 visual modes: classic and infotainment, S SPORT PACKAGE Sport Adaptive Damping Suspension Dynamically adjustable via Audi drive select w/-23 mm ride height from A4 standard suspension, Sports Rear Differential, Red Brake Calipers, CARBON FIBER TRUNK LID SPOILER, AUDI TRAVEL SPACE BASE CARRIER BARS storage bag. MP3 Player, Sunroof, All Wheel Drive, Onboard Communications System, Aluminum Wheels, Keyless Entry, Steering Wheel Controls. 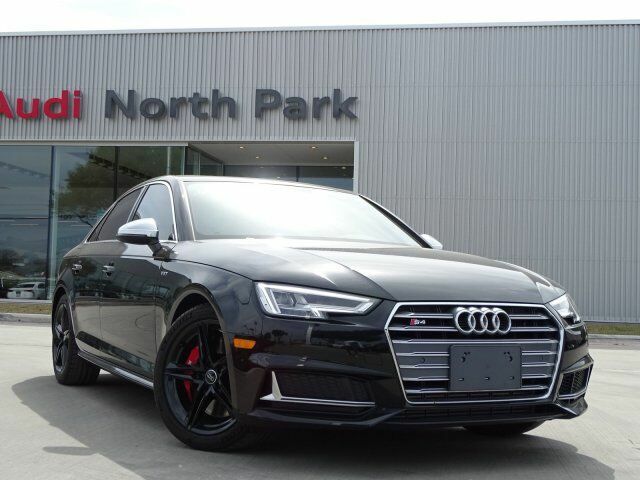 Audi North Park will provide an exceptional level of service when it comes to every element of the four rings. Whether it is choosing your next new of Certified pre-owned Audi, completing scheduled maintenance, or showing your love for the brand with a purchase of additional parts or accessories, the management team at Audi North Park is committed to a customer experience that creates a fan of both Audi and this particular dealership for life.